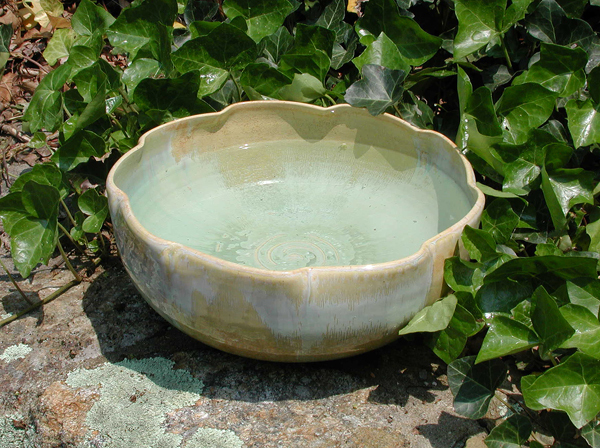 A friend and I used to have a joke, that whenever something came out of the kiln that wasn’t what we expected – the glaze turned a muddy brown, the walls had a crack, or there was some other major glaze flaw, we’d shrug our shoulders, say “oh well”, and toss it in our “dog bowl” pile. This large bowl came from that very pile. Hey… isn’t that the same glaze as the plates and mugs I have? I’d be happy to have my cereal or soup in that bowl! If it’s good enough for Marley…it’s good enough for me! btw…my cat Eliza drinks water from one of your bowls every day. She won’t drink from any other…smart cat! Hi Colleen, it’s a similar glaze to yours. This bowl is way too big for cereal, unless of course you eat an entire box at a time! Oh OK. I was gonna say this is way too nice for a dog.